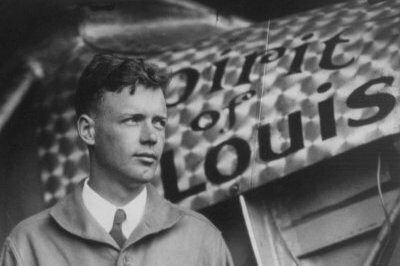 On May 20, 1927, Charles Lindbergh made aviation history by crossing the Atlantic Ocean from New York to Paris. After returning to this country, he celebrated his achievement by taking the Spirit of St. Louis on a tour of seventy-five American cities and Mexico. During this tour, he was forced by oncoming night and bad weather to land on a beach near the Cedar Hammock Coast Guard Station on the north end of Ocracoke. At that time, the beach was much wider and the packed sand provided an adequate landing strip. The men at the Coast Guard Station had already finished supper when Lindbergh appeared at the door. They offered him a plate of food and while he was eating, one of them recognized him and his identity was revealed to the astonishment of all. The next morning, after offering to take one of the men for a ride in his famous airplane (he was refused), Lindbergh took off from his sandy Ocracoke runway and continued his tour.